RA Surgery: How Successful is Surgery in Treating Rheumatoid Arthritis? Rheumatoid arthritis (RA) is a chronic disease whereby symptoms typically become worse over time. It can cause severe joint deterioration as well as leave bones and cartilage badly damaged. Today, there are many medical treatments available that are designed to prevent progressive joint destruction and to preserve joint function. However, there are cases where the damage has become so severe that RA surgery may be required. Surgery is less and less common today thanks to the availability of increasingly advanced medical and physical therapy treatments. However, there are times when certain types of surgeries may be necessary. Due to the chronic nature of RA, patients may experience joint deformation. This can cause severe pain and discomfort and limit the patient’s mobility and quality of life. RA surgery is used to treat severe joint deterioration. Surgery helps to relieve pain and restore mobility, so that patients can continue to perform daily activities. RA, however, affects multiple joints simultaneously. Often, the many small joints in fingers and hands are the ones most affected. This can make surgery very difficult as there are so many joints that become problem areas. RA surgery may be pursued when joint deterioration becomes so bad that surgery becomes a necessary option. This may happen when patients do not respond positively to medications or physical therapy. Patients may also become so debilitated that they can no longer walk, stand or move around without pain, or they can’t grasp or grip items with their hands to perform daily tasks. When daily activities become too difficult or impossible to perform, then surgery may be critical. In these cases, the particular patient’s case of RA may be considered very severe and so surgery becomes the only option for relieving pain and restoring joint function. How effective have medications been at preventing joint damage? How effective have medications been at relieving pain? Am I able to perform daily activities including physical, family, and social activities? Are my disease symptoms impacting my sleeping patterns? If any of these scenarios is negatively impacting your quality of life then surgery may be a consideration. However, surgery won’t usually restore a joint back to normal or to its full function. If the patient isn’t healthy enough for surgery or has underlying health risk factors, then doctors may consider surgery too much of a risk as recovery may be more difficult. Any types of other conditions like diabetes, high blood pressure, or lung problems will make the patient a poor surgery candidate. Doctors may also advise against surgery based on the patient being too young or too elderly. Artificial joints wear out more quickly in younger patients, and elderly patients face more potential surgical complications. Patients with untreated osteoporosis are also not proper candidates for surgery. If bone density levels are too low, then their bones won’t be strong enough to withstand a joint replacement. There are several types of RA surgeries available to patients. The type of surgery that is pursued will depend on the stage of the disease course, as well as the unique case of the particular patient. It will depend also on the areas of the body most affected, which joints require the surgery, and how many joints need surgery. 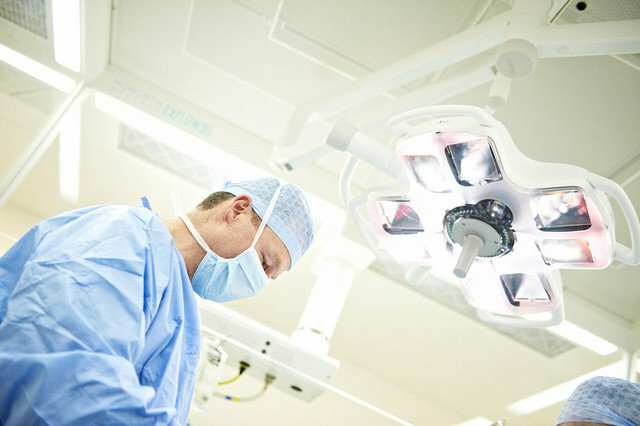 Other surgeries may include hip replacements as well as shoulder, elbow, knee, back, and neck surgeries. Arthroplasty is performed when the affected joint is entirely replaced or reconstructed. Joint bones can be reshaped to correct the joint structure. Otherwise, new joints can be constructed with metal or synthetic parts. This RA surgery restores joint function or fixes a deformity in the patient. It can relieve pain and stiffness and improve mobility. However, it cannot slow down or stop disease progression in any other joint. When a joint is severely inflamed, another type of surgery can be performed that doesn’t involve replacing or constructing the joint. Instead, surgeons can use a tool to remove the damaged and inflamed tissue from the affected joint. This is a surgical procedure called arthroscopy, and it is used to restore joint function and relieve pain. Like arthroplasty, arthroscopic procedures do not slow or prevent the disease’s progression. When nerves become compressed it can cause chronic pain and aching as well as weakness in the joints. For RA patients, this can often happen in the elbows, feet, toes, and especially wrists. Nerve compression in the wrists is called carpal tunnel syndrome. Nerve release or decompression surgery helps relieve pain and restore strength to the affected joints. With RA, the synovial lining within joints may become so inflamed that it prohibits function and movement. In this case, it’s possible to remove the diseased synovial lining. This procedure not only reduces swelling and alleviates pain, but it can also help prevent further damage to the joint. One of the most common characteristics of RA progression is how it can impact hands and wrists. There are several types of specific surgeries that can be performed on the hands and wrists. These surgeries include repairs to the tendons and ligaments in the hands. These surgeries can be very helpful in restoring movement of wrists, hands, and individual fingers. Though surgery can provide many positive outcomes, the results may only be temporary as the disease’s course can still progress despite surgical procedures. All surgeries present risks, but many of them can be highly effective at restoring mobility and alleviating pain. RA surgery is performed on a case-by-case basis taking into consideration the patient’s unique history and individual set of symptoms. With today’s advancements in medication types, the need for risky and painful surgeries is diminishing.